Day 5. Sunday. Pancakes and a food truck in one day! Sunday was semi-annual Clean Out the Garage Day. Wheee. So we needed a hearty breakfast to power us up. Pancakes and bacon, anyone? Bill made these whole wheat banana pancakes. I made bacon using a new method that a friend turned me on to: bake it in the oven! I know, this is not news to many people — but it took me a long time to come around, for some reason. Guess I like standing over a splattering pan of hot grease? Enjoy wiping down the walls, fridge, and microwave after I make it? Who knows. But I will be going bacon crazy now that I know I can get good organic / local stuff that fits Our Rules, so I needed a cleaner approach. And here it is: line a couple of baking sheets with aluminum foil, put down a layer of bacon on each and pop them in the oven at 400degrees for about 20 minutes. The best thing of all is that I didn’t have to stand there at the stovetop the whole time — start a load of laundry, read the paper, drink my tea…. Anything that allows me an opportunity for multitasking, makes me insanely happy. Anyway, the pancakes served up with yummy, yummy Yoder Farm maple syrup were a big hit with all of us, EXCEPT — there they were again, the “eyes of disappointment” — the 9 y.o. Fortunately, there was a lot of bacon. We all loved each other again by garage-cleaning time. Lunch was left over mac & cheese. And one more attempt at a cheese quesadilla on homemade tortilla for the 9 y.o. (since he didn’t like the mac & cheese). Fail. “Eyes of disappointment.” He got himself pretzels, cheese sticks, and an apple instead. Then I baked another loaf of bread in the bread machine. Less honey this time. But still nobody was raving about it. Back to the drawing board for something that will work for kid sandwiches (and please you-know-who). Dinner was a big thrill for all of us. Our good friends who live up the street, had a little get-together and hired a food truck! 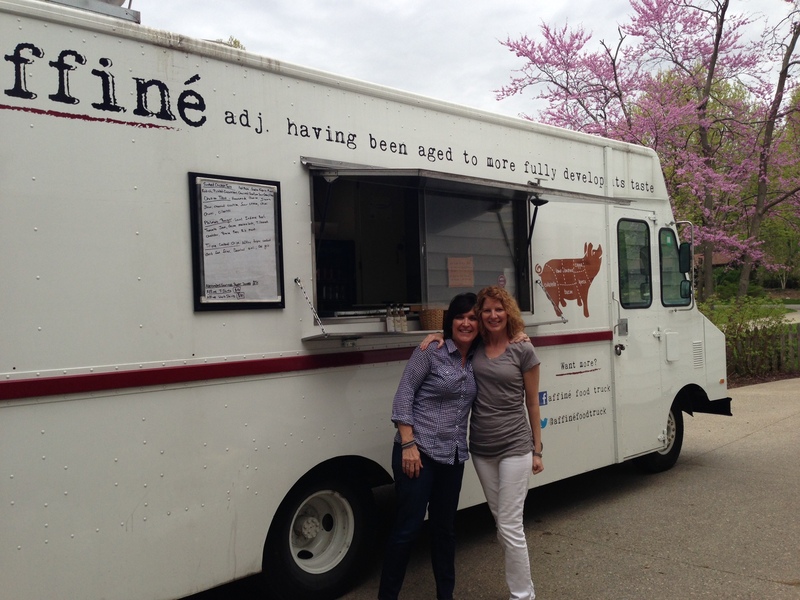 Which is an AWESOME idea in and of itself — but even more awesome was that it was Fort Wayne’s own Affine Food Truck! A “farm to fork company that specializes in locally sourced, whole animal butchery and nose to tail usage with a focus on artisan handmade meat products.” Yeah, baby! 5 y.o. and I shared the Philmore Burger (w/out the bun): “local Indiana beef, tomato jam, onion marmalade, Tillamook cheddar, and braised pork rib meat” – fantastic! The other boys and Bill had a few of the tacos: Smoked Chicken “with red mole, queso fresco, pickled radish, pickled cucumber, charred scallion, sour cream” and Chorizo Taco “house made chorizo, jicama slaw, charred scallion, sour cream, chimi churri, cilantro”. Wow. Everything was amazing. I’m kicking myself that I didn’t take any pictures of the food — once again, got distracted by the business of eating — but here I am with my pal, Kristin, in front of the food truck in her driveway! Check out Affine’s website or follow them on Facebook to see where they’ll be setting up around town next. They’ll be the chefs at The Philmore on Broadway for the next blues show and dinner on June 1, as well.